Offering Sailor Moon DVD Videos Sailor Moon Music CD Books Sailor Moon Dolls and more with easy online ordering. The story centers around an air-headed crybaby, named Serena, and her friends Amy, Rei, Lita, and Mina. Using special powers, they can transform into Sailor Scouts. They become Sailor Moon, Sailor Mercury, Sailor Mars, Sailor Jupiter, and Sailor Venus respectfully. They fight for love and justice against the evil minions of the Negaverse. To help them in their quest, they heed the advice of two talking cats, Luna and Artemis, and also the mysterious Tuxedo Mask. 7 volume disc set, includes all 39 UNCUT episodes of the "SuperS" TV series! All three films, Serena and her friends Amy, Raye, Lita, and Mina (Usagi, Ami, Rei, Makoto, and Minako in Japanese), aided by Darren (Mamoru), fight off aliens bent on destroying the world. In the R movie (1993), the villain is Fiore, who is held in thrall by the sinister Kisenian Flower. In the S movie (1994), Kaguya wants to encase the Earth in ice; Badiyanu kidnaps children and uses their "dream energy" to create a planet-engulfing black hole in Super S (1995). The two later films include "Outer Scouts" Michiru, Haruka, and Setsuna, a.k.a. Sailors Neptune, Uranus, and Pluto. R enjoys the best reputation among fans and has the most interesting story. Fiore treats Serena as a rival for Darren's affections, and the subtitles suggest the attachment is quite passionate; the dubbed version sounds tamer. A weird subplot in which Luna the cat falls in love with the kindhearted astronomer Kakeru throws the S movie out of kilter. Super S offers imaginative visuals, including elaborate CG effects and brightly colored backgrounds. All three films provide the broad humor, budding adolescent romance, magic, and affirmations of the power of friendship that Sailor Moon fans expect. It is a brand new era for Sailor Moon and the Scouts. As Darien is about to depart for America to attend university, he crumbles and disappears. Meanwhile, a mysterious little girl, RiRi, and three new Scouts, the Sailor Starlights, appear on the scene. As the new Scouts appear, Mercury, Jupiter, Venus, and Mars disappear into a supernatural void. Bunny is forced to deal with the fact that everyone she loves is gone. Are the Scouts gone forever and are the Sailor Starlights involved? 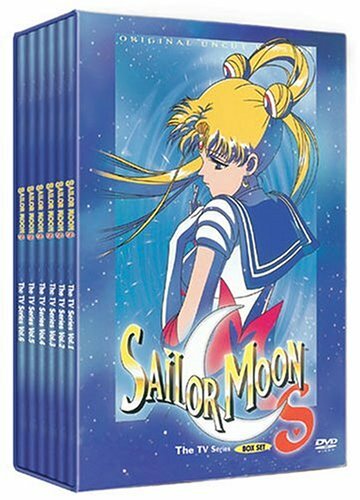 Don`t miss this heart-pounding edition to the Sailor Moon saga.